One of life's necessary evils is a trip to Cheaptown - aka IKEA. Like everywhere else on the planet, IKEAs in Copenhagen are located in big box areas outside of the city. There are two within 10 km of our flat and I headed out to one of them to buy some boxes for my son's room. He has 15 kg of LEGO and when we redid his room we figured some stackable shoe boxes on the wall would be great for the LEGO. If we need some bigger things from IKEA, we will usually grab a car from our car share programme. But on a Saturday morning I hopped on the Bullitt cargo bike and headed off to get the boy his boxes. As you've probably gathered by now, there are separated bike lanes basically anywhere you want to go in Copenhagen. Even places you DON'T want to go, like IKEA. Here's a little photo series of my Tour de IKEA 2009. In the above photo an onramp leads to one of the main motorways into/out of Copenhagen. The bike lane I'm on continues down under the ramp, while the cars go up. 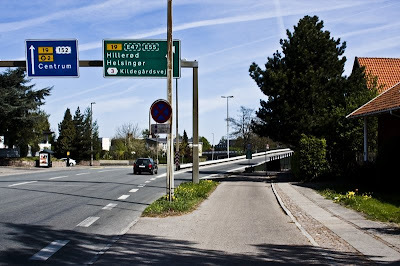 Photo Left: These are signs for the regional bike route network, informing you that route 50 leads into Copenhagen. The bike lane on this stretch of motorway runs alongside the three lanes for cars. Separated, of course. It's a busy stretch for all traffic and in the morning rush hour bikes roll happily past the kilometres long traffic jam. Photo Right: I turn left to get onto the northbound bike lane running parallel to the #19 Motorway. The classic Copenhagen Blue colour guides the way. Photo Left: It's a bus stop. Many busstops in Copenhagen are designed like this. The bus passengers disembark onto a little 'island' where they must wait for a hole in the the bicycle traffic on the bike lanes before crossing to the sidewalk. Even out here in the suburbs. At busstops that don't feature an 'island', the bicycles are made to stop for the passengers. Photo Right: I'm riding along the motorway now and another onramp for cars is coming up. I just keep riding straight. 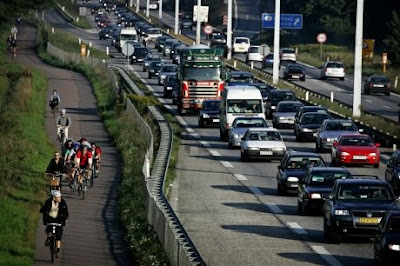 Photo Left: Pity the motorists in a bicyle culture. All that bicycle infrastructure... it's hard to tell what's up and what's down. So it's nice that they get little car pictograms painted on the asphalt to help them identify parking. Photo Right: I'm off the bike lane parallel to the motorway and here's a roundabout - traffic circle - near IKEA. The bicycle lane is clearly marked and hey, there's even a hobby cyclist in lycra out for a lovely Saturday morning ride! So THIS is where they are! Photo Left: Here's the other side of the roundabout. The bike lane on the circle hooks up with the main bike lane on this stretch of street. The principle is the same for all traffic. Whoever is in the roundabout has the right of way. Photo Right: Arrival. Needless to say, IKEA has a ramp up from the street for bikes and prams. Photo Left: It's a tiny detail, but I like it. There's a sign on this emergency exit asking you to park your bicycle in the bike rack. But there's no red circle around the bike, with a red line through it. Just a nice pictogram of a bicycle and a polite text. So here's me ready to go home. My Bullitt is loaded up and the boxes are tied firmly, but really badly, onto the cargo box. Typically for a visit to IKEA, I bought stuff I didn't plan on and probably don't need. A parasol for the kids in the front yard is sticking out. In the background you can see fine Velorbis Churchills with trailers. 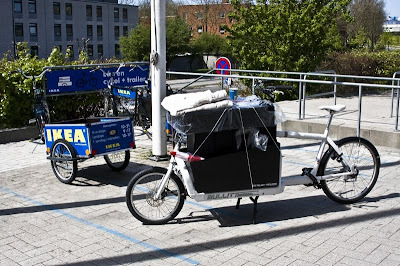 IKEA loans out out these free bicycles and trailers to customers so they can transport their stuff home, just like the free car trailers they have. 20% of IKEAs customers in Denmark arrive by bicycle or public transport. Here's the full story about IKEA Denmark's bicycle loan programme. Photo Left: The quickest way out of IKEA is down the ramp for cars. The bike lane parallel to the motorway is just at the end. Ready to transport me safely back to the city. Arrival. Now all I need to do is find Felix so he can help me carry the boxes up to the flat. Here's another motorway, the #16. I used to cycle each day along this motorway on my way to work out of town and it was always splendid passing the traffic jam heading towards the city centre. The entire traffic jam.